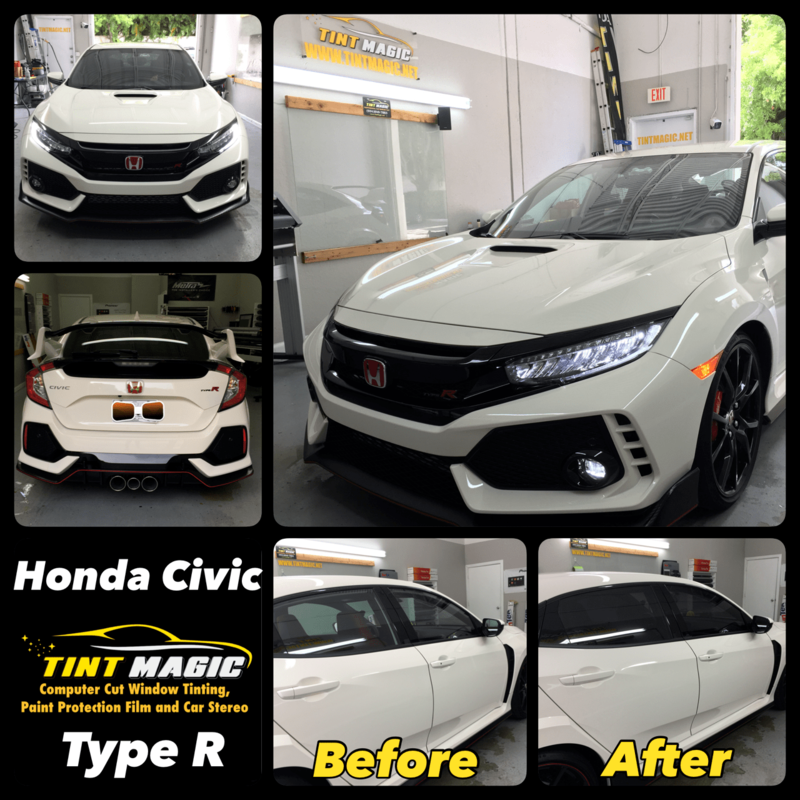 Honda Civic Type R at Tint Magic Window Tinting Coral Springs. We use SunTek CXP (Nano Carbon) 25% all over around for the best heat rejection and UV protection. Call us for the best quality and service! (954)840-7883. Honda fanboys and fangirls, your patience has been rewarded: For the first time in the U.S., the Civic Type R is here, and it’s glorious. A 306-hp turbocharged 2.0-liter inline-four with a six-speed manual transmission and front-wheel drive is the only powertrain. A front-strut suspension—Honda calls it dual-axis—eliminates the torque steer normally associated with high-powered front-drive vehicles. Navigation, Apple CarPlay, Android Auto, and a 540-watt 12-speaker stereo are all standard. The hottest Hondas offered to Americans often wore an Acura badge, including the NSX supercar and the oldie-but-goodie Integra Type R. But with Ford’s wild Focus RS joining the Subaru WRX STI and the Volkswagen Golf R in the U.S., the time has come for Honda to finally introduce a machine here that wears its vaunted scarlet H emblem: the 2017 Civic Type R.
What sets this Honda apart from other sport compacts is how it balances speed, body control, and outright cornering prowess with the day-to-day ride comfort that you would never expect given its rubber-band-like 30-series tires. Indeed, those 245/30ZR-20 Continental SportContact 6 performance treads offer seemingly no cushion for the spindly 20-inch aluminum wheels, and they’re pricey at $320 a pop. Even with its driving-mode selector in its full-attack +R setting—which slightly weights up the steering over the lesser Sport and Comfort modes and puts the three-position adaptive dampers in their firmest tune—the ride is fully livable. Combined with a high level of standard amenities and wonderfully comfortable and supportive sport seats (available in red cloth only), there’s little compromise to having a Type R as your sole mode of transport.